Amazon is offering 5 percent cashback on prepaid orders and a no cost EMI options for customers. BookMyShow is also offering free couple movie vouchers on the purchase of Vivo smartphones. 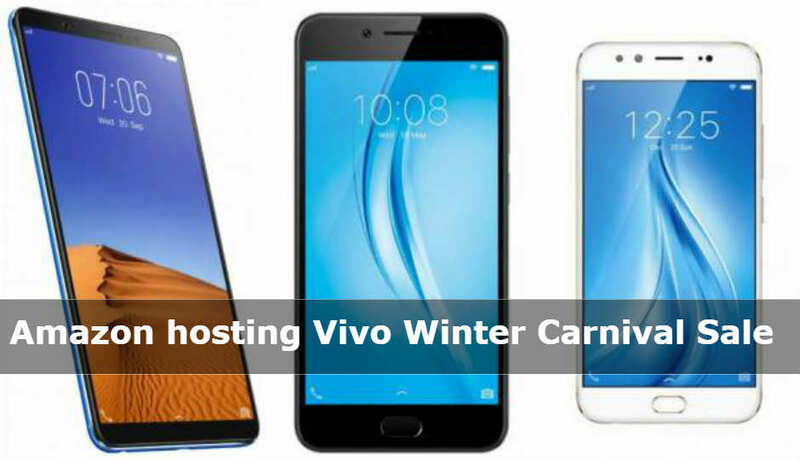 Amazon is hosting the Vivo Winter Carnival Sale from November 15 until November 17. The online retailer is offering discounts across a range of Vivo smartphones. Buyers will get 5 percent cashback on prepaid orders and can also receive upto Rs 3,000 off on exchange. The cashback will be credited to a user’s Amazon Pay balance within 72 hours. Customers can also save upto Rs 1,700 by using the no cost EMI option while buying the phones. Futher, BookMyShow is offering free couple movie vouchers to those tho purchase the Vivo smartphones. The Vivo V5S is up for sale priced at Rs 17,990 against its previously listed price of Rs 19,990. Buyers will get an additional Rs 3,000 off on exchange and a no-cost EMI option for 3, 6 or 9 months. Amazon is offering the Vivo V5Plus smartphone at a price of Rs 19,990. Buyers will get an additional Rs 2,000 off on exchange along with a no cost EMI option. Amazon is not offering any discount with the Vivo V7+, but users will get an extra Rs 2,000 off when exchanging their old smartphone. The device is also available with a no cost EMI for 3, 6 or 9 months. Vivo’s Y69 and Y66 smartphones can be purchased from Amazon at a price of Rs 14,990 and Rs 13,990 respectively. Customers can avail extra Rs 2,500 off on exchange with Y69 and Rs 2,000 on exchange with the Vivo Y66. The no cost EMI offer is applicable on both the smartphones. Amazon has listed the Vivo Y 55S smartphone at Rs 11,990 and the Vivo Y53 at Rs 9,990. Buyers can avail an additional Rs 1,000 and Rs 1,500 off respectively when exchanging their old smartphone.